Many people know that Branson is one of the most favorite vacation destinations in the Midwest may be because it is a place where you can find world-class live entertainment shows, exciting attractions, museums, and great outdoors. But did you know that it is also a favorite spot among sports enthusiasts, thrill-seekers and even daredevils? From a heart-pumping free falls to an exhilarating rollercoaster ride that will have you gasping for breath, real adventures begin in Branson. 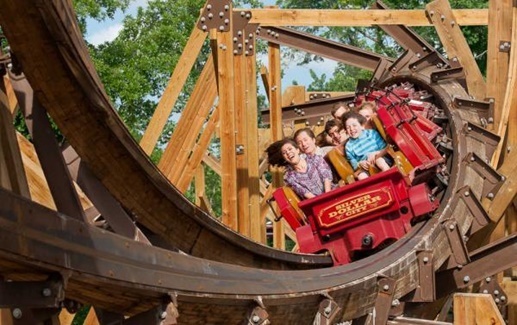 You have may have experienced riding a coaster that twists, turns and flips you upside down, but maybe you’ve never ridden a coaster quite like the Outlaw Run at Silver Dollar City. This award-winning Outlaw Run has some good features – it’s the second steepest and second fastest wooden roller coaster in the world, and it is the first wooden coaster to feature a death-defying double-barrel roll and three upside twists. The Vigilante Extreme ZipRider at Shepherd of the Hills is an interesting zipline activity where you get to enjoy the peaceful, breathtaking vistas from the tallest point in Missouri. From the top of the observation deck, you can have a view of Arkansas on a clear day. Once you are launched with the thrilling zipline ride, you will travel at 50 mph zip line flight above the historic homestead with a picturesque view of the surrounding natural scenery and the city of Branson. If you want to try a unique recreational activity on the Branson Strip, have some fun with the Ejection Seat at Branson Frontier Adventures. This is a human slingshot known as the Ejection Seat that launches riders 175 feet into the air, and bounces all around and upside down several times until gravity pulls you down. You really can feel a heart-pounding experience once you blast off. Such an exciting ride into the air and bouncing up and down until it gains its gravitational force. Ever want to take a ride with the Flyboard on the Table Rock Lake? Well, you can try this now. This newest water activity on the lake is introduced by Flyboard Branson. With flyboarding, you can surf the sky with a special board that straps to your feet (just like a wake board) and you will soar into the air propelled by jets of water. Another great water activity is the KaPau Plummet at White Water Park. It’s a kind of activating your adrenaline rush on the water that you can only experience in Branson. KaPau Plummet in Branson is voted a must-water slide ride when it opened in 2014 by LA Times, NBC and the “Today Show.” This breathtaking adventure begins 40 feet above the ground inside a huge, 245-foot water slide. Just as when you are set to go – it will drop to an exhilarating 26 feet per second free fall until your final splash landing. The plentiful outdoors in Branson are really great for some adrenaline pumping activities such as thrilling rides and other water adventures in the TriLakes area.